You probably don’t know about the 9-hour German invasion of Denmark on April 9th, 1940. But like all historical events, this little “blip” on the radar of history involved real men and women. They were people, too, just like our own grandfathers and great-grandfathers who experienced the life-defining challenge and tragedy of this time in human history. I learned about these forgotten defenders from the 2015 movie, April 9th, 1940, which is one of the finest movies I’ve seen World War II from a non-US perspective. It follows a bicycle-mounted unit of Danish soldiers through the drama of the long day of the German invasion. With limited ammunition, manual-action rifles, and bicycles, these Danish defenders still managed a decent job of defending their home country against overwhelming odds. Were it not for those odds, the thorough blitzkreig of the German attack strategy, and the rapid surrender of the Danish government (cut them some slack – Denmark is a small and not-very-defensible country), they likely would have put up a much longer fight. If you’re a bicyclist, you have to give them props: you try pedaling for your life – and your mates’ lives – cross-country with a machine gun strapped to your frame. Beyond just Denmark, many of the doomed soldiers of the doomed “little” countries invaded in 1939-40 deserve credit they don’t often get. Most Americans know the American history of World War II, and perhaps some of the British story. They probably don’t know about the countries which fought Nazi Germany and/or the Soviet Union with very little certainty that they stood a chance . A good number of them escaped and fought another day. The French bought time for the British to escape at Dunkirk by resisting famed German general Erwin Rommel at the siege of Lille. The Norwegians socked it to the German warship Blucher and resisted for two months – as Wikipedia notes, the longest resistance of any invaded nation to that time. War is an evil, but it takes some virtue to put up resistance to tyranny. 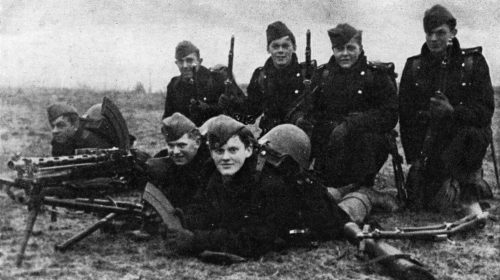 So there is some virtue to remembering the people who resisted Germany on April 9th, 1940, and on all of the ill-fated defensive fronts of 1939-40.